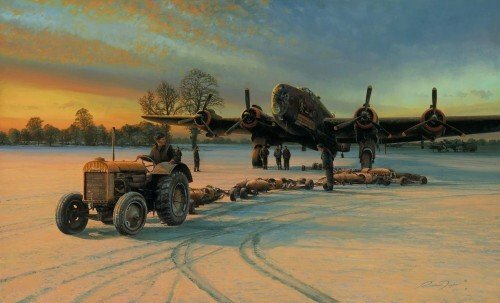 Richard Taylor’s hauntingly beautiful new painting ‘Action This Day’ depicts a scene on a cold winter’s morning, as dawn breaks over RAF Lissett, revealing that last night’s biting wind has once again brought a covering of snow to the airfield. But, with conditions forecast to improve, tonight’s operation to bomb industrial targets in Germany is set to proceed, and ground crew start to prepare Halifax Mk3 LV907 ‘F-Freddy’, simply known as ‘Friday 13th’, for action. This iconic aircraft flew an impressive total of 128 operational sorties with 158 Squadron between March 1944 and April 1945, and with Richard Taylor’s prints signed by up to eight former members of 158 Squadron, this evocative and eye-catching masterpiece is a collectors’ gem. Joining artist Richard Taylor, each print in this limited edition has been individually signed in pencil by THREE veterans who flew with the Halifaxes of 158 Squadron. Richard Taylor’s beautiful, highly detailed pencil remarques are now some of the most collectible items in the world of aviation art, and for this publication there will be a choice of two editions, both featuring the outstanding Handley Page Halifax. The first will each have a single ORIGINAL pencil drawing gracefully hand crafted by the artist, and the second, de-luxe edition, will be issued as an outstanding DOUBLE SIZE Remarque drawing, measuring approximately 10˝ wide! Richard's pencil work is nothing short of superb and widely regarded as amongst the best in the industry. 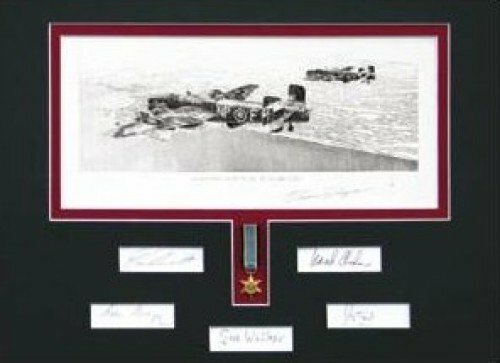 These magnificent Tribute Proofs, created with a unique and highly-collectible original pencil drawing by Richard Taylor, are issued to include the matted signatures of no less than FIVE of the Royal Air Force’s most eminent wartime leaders. This is undoubtedly one of Richards most exclusive and collectable editions to date and we expect demand to be high so please contact us for availability.